Penn State gave up 38 points to a mid-major at home Saturday night, barely escaping Appalachian State with a 45-38 OT victory. So, the defense is awful, right? It sure looked that way. But maybe, just maybe things won’t be as bad as they appeared in the opener. I’ve made no secret of the fact that I believe PSU’s defense is going to struggle big time this season. 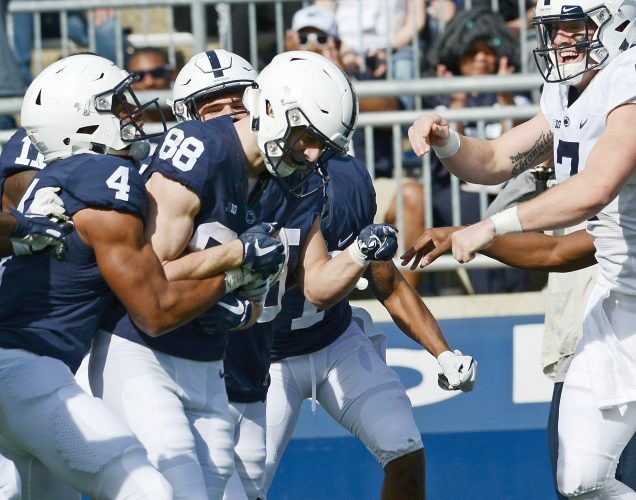 The Nittany Lions are replacing eight starters, tackle depth and experience could be big problems and the middle linebacker spot is a huge concern. App State pummeled PSU’s defense for 28 points in the fourth quarter, gained 451 yards on the night and passed for 292 yards. Now, I realize I’m not the guy Penn State fans turn to for glass is half full optimism, but I’m going to take a crack at it. The Lions’ defense allowed only three points over the first three quarters, with App State’s other seven points coming on a kickoff return for a TD. The Mountaineers gained 60 yards on their first series of the night, then gained just 6, 3, 26, 5 and 24 yards on their next five series until starting a drive late in the third quarter. Penn State was playing, remember, without starting defensive tackle Kevin Givens, who was suspended for violating team rules. You have to believe some things might have been a bit different for App State in the fourth quarter had Givens played. Cornerback John Reid also sat for long portions of the game, for unknown reasons (maybe he was hurt, but he was on the field late). So, what we’re left wondering is: Will PSU’s defense more closely resemble the solid unit from the first three quarters, or the one that got destroyed in the fourth quarter? The Lions are playing a lot of young players on defense, and those guys will get better as the season goes on. The secondary has a chance to be good, despite what it showed in the fourth quarter, and Amani Oruwariye showed he’s the real deal with his game-ending interception. Now, for the glass half empty perspective. Penn State’s defense got shredded by a redshirt sophomore quarterback, Zac Thomas, making his first career start. He threw all of 10 passes last season. through the air. 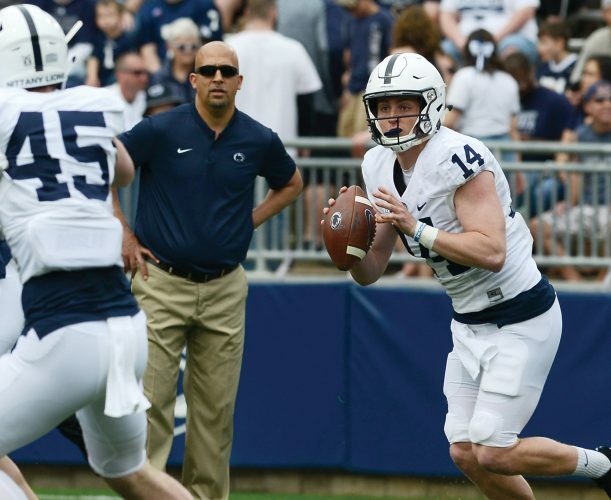 You can say that about most defenses, but it will be even more of a problem for Penn State because the front seven probably will have trouble stopping the run, as well. App State had 159 yards rushing, behind an offensive line that averages just 283 pounds. Good grief, what might Wisconsin and its collection of 320-pound linemen do to Penn State’s defense? One big question going forward is just how long Givens will be out. If it was just a one-game suspension, then he could and will need to have a big impact this week at Pitt. But if Givens has to sit out this week, as well, the Panthers will have a stronger chance of controlling the clock with their running game, thereby giving them a better chance at an upset. All we know for sure after week one is that Penn State’s defense got embarrassed by App State, and it took Trace McSorley and the offense to bail them out. That’s what I expected to happen a whole bunch this season, just not in this game. It was a tough decision, no doubt. But App State coach Scott Satterfield made a mistake trying for a 56-yard field goal instead of going for it on fourth-and-4 from the PSU 39 with 20 seconds left and the game tied at 38. Penn State got extremely lucky, because it very well might have lost had the Mountaineers gone for it. App State had been getting just about everything it wanted on offense in the fourth quarter. It had one timeout left. There was probably a 55-60 percent chance it would have converted on fourth-and-4, compared to a 10-15 percent chance of making a 56-yard field goal. The kick was long enough but went wide right. If App State would have gotten a first down, the clock would have stopped to move the chains, then App could have spiked the ball with about 12 seconds left. It could have run another play, and if that one had gone for 6-8 yards, then the Mountaineers would have been around the 25-28 yard line. That would have been a field goal between 43-46 yards, which would have been much more manageable. That’s all the best-case scenario for App State, of course, and it may not have worked out that well. But denying his surging offense a chance to even try for the first down is something Satterfield very well might second guess himself on for the rest of his career. Just for fun, I ran a Twitter poll on what App State should have done on fourth down, and after 340 votes, 83 percent said the Mountaineers should have gone for it. So it appears obvious to all of us armchair quarterbacks. It may seem unfair to criticize Satterfield after his underdog team nearly pulled off a stunning upset. But in that situation, with the players doing everything they could, the coach really had to be perfect in his decision making to give his guys any and every possible edge. Once the game went to overtime, it seemed to be a given that PSU — the better team and the home team — would win. So the harsh reality is that Satterfield hurt his team with the game on the line by making a decision that had little chance for success.